Puzzling Wild Honey Questions. Need Your Help! I am puzzled. Does wild honey really taste sour? And does it produce a crystal clear solution when mixed with water? 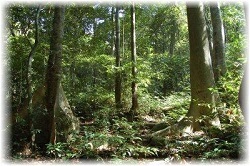 "Unlike other honey, our honey is harvested from natural hives in the wild forests e.g those of Africa. They are gathered from drops of honey falling down directly from honeycombs and have bypassed all thermal treatments...Laboratory reports have established our products as wild honey, which has more superior (seven times more) health benefits than honey extracted form made-made hives. Wild honey has a very slight sour taste and does not freeze in the freezer. 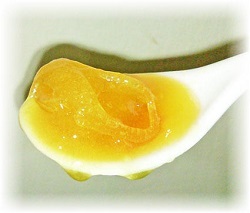 To test for wild honey, mix it with egg yolk and the egg yolk would appear to turn half-cooked. And when mixed in water, the solution obtained is clear and not cloudy." Some of their claims about wild honey have left me scratching my head. And I have also been warned that the clarity of the honey solution could be a result of an ion-exchange process. After a few failed attempts in getting an email response to my questions from the shop, I began to wonder if these honey suppliers actually have an answer for this. So, if you are a honey buff, expert,or beekeeper and you know the answer, I can't wait to get your thoughts, advice and views on this! My friend have been recommending me Yummi House active wild honey. I am not sure of its authenticity as saw both positive and negative reviews online. Comment? Ruth: When mixed with water, this honey makes a very clear drink, which is an indication that all traces of bee pollen and other nutritious natural substances have been filtered off. Read more views of clear honey on this page. The creator vs man is a no brainer but some people have no respect. Why did my wild honey turn cloudy? When I put it in the jar one month ago it was clear. Ruth: It sounds like the honey has crystallized, hence the cloudiness. Granulated honey can be warmed between 40 to 50 Celsius degree in a water bath. Ref: Honey Storage Tips. I intend to buy some wild honey but I don't know if airlines allow passengers to bring aboard wild honey in glass bottles? Since wild honey has active enzymes, will it be risky? Ruth: Airlines do not allow liquids more than 10ml to be carried on board. Honey can be packed into the luggage or separately packed into carton boxes and checked in. Active enzymes in honey are not a concern. Only difference is where the hives are put. The above story about wild honey having a sourly taste is rubbish. The wild honey collected from the wild in Africa will taste like all my honey that is collected from feral hives in roofs of homes, holes in the ground, swimming pool pumps etc. It has no specific taste but it is fantastic!!!! and 100% RAW unprocessed, but for having it dripping through a muslin cloth at room temperature. Different areas will taste differently, but never sour. I'm writing with reference to your Puzzling Wild Honey Question article. I've been taking raw honey for years, incl Really Raw Honey. And like you, when I heard about this honey from my colleague, that this shop sells honey that is clear which is supposed to be good, I decided to search for an answer and found your site. I can see you puzzling over it like me, so I searched on and found this site http://itaiwanfarm.com/index_test.html. This site suggested conducting a test and from the results, they claimed "Pure Honey contains Protein,Pollen and Active Enzymes...etc,so it is cloudy." Ruth: Hi Corinna, I agree that the presence of bee pollen can cause honey to appear cloudy, so it is not good for the "wild honey" to have such clarity in its appearance. However, I don't quite agree with the mentioned claim because the two terms "pure" and "raw" are entirely different concepts. Pure honey basically refers to 100% real honey, unadulterated (as opposed to honey that has been added with sugar, corn syrup, starch, etc, etc), whereas raw honey refers to unheated, unpasteurized honey. Hence, you can have pure honey that is not raw, whereby the live enzymes have been destroyed by high heat during the processing. Similarly it is also possible to find pure honey that contains no bee pollen because it has been all filtered away during the bottling process to make it clean and clear for commercial sale. I am also combing my head over a sort of sour honey sold in my country by the locals (natives). It is claimed to have wonderful medicinal properties and so trusted, however, it does not have the properties you mention. I have just bought some wild honey from a street stall. It was in a 250ml ex-wine bottle. The honey was collected from Burma, just over the river here in MAE SAI. I could of bought honey dripping honeycomb, but too messy. Now by swigging straight from the bottle I can tell you that it has a sweetish taste, easy on the palate and so I must swallow a few tablespoons of it. Colour..light brown. easy flowing ...and just so delicious. The villagers collect from wild bee clusters. Just sieved and sold. The 250ml cost me 150 BAHT, about 5 US dollars. I am off to get another bottle. Is it true that wild honey is different from raw honey and they claim that their honey is better in terms of health benefits. 1. Which Honey to Buy? I want to know if 'wild/active' honey can crystalise? Ruth: All natural honey undergoes crystallisation over time. The speed of granulation depends on the storage temperature as well as the composition of the honey, that is the floral varietal. 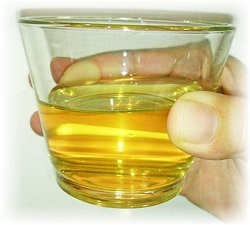 At a very low temperature, honey enters a glassy state and becomes an amorphous, noncrystalline solid. For commercial honey that appears as permanently stiff and crystal clear, my guess is it could have undergone a special processing that has set the state of the liquild as such. I am a wild honey seller and i have no any experience about mentioned above. The difference with wild honey is its sweet smell and taste. My ph no:944702520. I read with great interest on this section. Just yesterday I was at one of the wild honey stores. I was given to taste a few types of the wild honey and initially was very impressed with their claims. I nearly purchased and become their silver membership. Their sales strategy is very aggressive. But what disturbed me was their way of putting down Manuka honey. They claimed that the cloudiness of Manuka honey is due to the preservatives in the Manuka honey. They said that their wild honey has no expiry date and reason that Manuka honey has expiry date is again because of the presence of preservatives. That was when I decided to start my own research probject on honey and then found your site. I am writing to appeal for more info on this wild honey. Are they really better than the farmed-honey (a phrase that they use)? Ruth: Suriya, I don't have an answer whether wild honey or farmed honey is better. And I'm not sure if the question is that straightforward after all. However, until now the appearance of the candy-like form of the honey before mixing anything remains to be the most mysterious and puzzling to me. I have bought wild honey from other sources but have never encountered such thickness. I guess at that price tag, they had only medicial grade Manuka (as opposed to food grade) to pit against, but if they could come up with a credible measurement of the "ACTIVE" medicinal properties for their honey just like the NPA, MGO or UMF factor in Manuka (10+, 15+, 20+, etc), that would be more convincing. As for the criticism that since Manuka honey displays an expiry date, preservatives must have been added, it is not the first time I have heard about this from others who have purchased from them. Honestly, I find it rather ridiculous to present such an argument when we all know that "the best before date" is a commercial requirement of foods sold here. End of "Puzzling Wild Honey Questions. Need Your Help!". Back to "What's Considered Good Quality Honey".